Childhood Obesity Starts with Mom: California Pre-pregnancy and Pregnancy Weight Suzanne Haydu, MPH, RD, Carina Saraiva, MPH, Aldona Herrndorf, MPH, Renato. 1 Childhood Obesity Starts with Mom: California Pre-pregnancy and Pregnancy Weight Suzanne Haydu, MPH, RD, Carina Saraiva, MPH, Aldona Herrndorf, MPH, Renato Littaua, DVM, MPVM, Portia DuBose California Department of Public Health; Maternal, Child & Adolescent Health Division Childhood Obesity, Maternal Health and the Life-Course Perspective Life-Course Weight Trends Among California Women Title V: Maternal, Child and Adolescent Health Interventions References Conclusion A series of interacting risk factors over the life-course contribute to the problem of obesity. Yet, current policies focus on interventions later in life, after other factors accumulate and interact thus predisposing a person to obesity. A life-course perspective can be used to develop comprehensive interventions that address the up-stream multiple determinants of obesity 4. Figure 1. Life course Perspective 5  Amir LH, Donath S. A systematic review of maternal obesity and breastfeeding intention, initiation and duration. BMC Pregnancy and Childbirth. 2007; 7:9. Thompson DR, Clark CL, Wood B, Zeni MB. Maternal Obesity and Risk of Infant Death Based on Florida Birth Records for 2004. Public Health Reports, July-August 2008; 123: 487-493. Association of Maternal and Child Health Programs (AMCHP)/CityMatCH Women’s Health Partnership. Promoting Healthy Weight among Women of Reproductive Age, January 2006. Johnson D, Gerstein D, Evans A, Woodward-Lopez G. Preventing Obesity: A Life Cycle Perspective. JADA. 2006. Vol. 1: 97-102. The Secretary’s Advisory Committee on National Health Promotion and Disease Prevention Objectives for 2020. Phase I Report: Recommendations for the Framework and Format of Healthy People 2020. October 2008. Accessed on 6/2/09. Available at http://www.healthypeople.gov/HP2020/advisory/PhaseI/PhaseI.pdf. Lu, MC, Halfon, N. Racial and Ethnic Disparities in Birth Outcomes: A Life-Course Perspective.2 Maternal and Child Health. Source: California Maternal and Infant Health Assessment (1999-2007) Notes: Pre-pregnancy body mass index (BMI) was calculated from self-reported weight and height. Maternal weight status categorized according to pregnancy-specific definitions issued by the Institute of Medicine (IOM), which classifies pre-pregnancy BMI as ‘Underweight’ ( 29 kg/m2); ‘Very Obese’ is BMI ≥ 35 kg/m2. Source: California Women's Health Survey, 2006-2007. Source: California Maternal and Infant Health Assessment (MIHA), 2005-2007. Takahashi ER, Libet M, Ramstrom K, Jocson MA and Marie K (Eds). Preconception Health: Selected Measures, California, 2005. Maternal, Child and Adolescent Health Program, California Department of Public Health, Sacramento, CA: October 2007. There has been an upward trend in the prevalence of pre-pregnancy overweight and obesity in California. In 1999, 12.7% of women were overweight and 18.3% were obese prior to pregnancy; these figures grew to 15.6% overweight and 20.5% obese in 2007 7. During 2005-2007, one in three women entered pregnancy either overweight (14.3%) or obese (20.6%). African Americans (46.1%) and Latinas had the highest prevalence of pre-pregnancy overweight and obesity, followed by Whites (27.6%) and Asian/Pacific Islanders (15.7%). Latinas born in the U.S. appeared more likely to be obese (29.5%) than their foreign-born counterparts (24.9%). (Figure 2) Figure 1: California Women ages 18-44 Trying to Become Pregnant, 2006-2007 8 The life-course perspective has far-reaching policy implications for reducing childhood obesity. Public health interventions need to be integrated, and should include multiple factors interacting over the life course (biological, psychological, behavioral, and social determinants of women’s health). The life-course perspective, especially before, during and after pregnancy is an opportunity for other community and state organizations to collaborate with MCAH to reduce the incidence of childhood obesity. Figure 3: Weight Gain During Pregnancy by Pre-pregnancy Weight Status, 2005-2007 9 Notes: Sample Size=214, *Healthy weight includes women with a BMI of 18.5 - 24.9; underweight women (BMI 25 (Figure 1) Figure 2: Pre-pregnancy Overweight and Obesity by Race/Ethnicity, 2005-2007 9 Figure 4: Weight Gain During Pregnancy by Race/Ethnicity, 2005-2007 9 Figure 5: Infant Feeding Practices by Pre-pregnancy Weight Status, 2005-2006 9 The life course perspective often focuses on duration, timing, and ordering of major life events and their consequences for later development. Interventions developed by MCAH to reduce childhood obesity are based on these premises 6 :  developmental processes are continuous throughout life  sequences of life events for mothers and their children are interconnected and have reciprocal effects on one another  efforts to optimize human development will be most effective if they are sensitive to developmental needs and capabilities of particular age periods in the life span Childhood Obesity: Moms Make the Difference Women who are overweight or obese prior to conception, or gain excessive weight during pregnancy are more likely to deliver either under or overweight babies. Infants born either under or overweight are at increased risk for obesity later in life. Breastfeeding is the infant feeding practice known to reduce the risk of childhood obesity 1-3. Babies born to women who are overweight or obese prior to conception are less likely to be breastfed, and are at increased risk for being overweight themselves. Many California women trying to become pregnant are overweight or obese Overweight and obese women are less likely to breastfeed, which predisposes their offspring to childhood obesity Table 1: Recommended Total Weight Gain Ranges for Pregnant Women by Pre-Pregnancy Weight Status Underweight (BMI < 19.8)28 – 40 lbs Normal Weight (19.8 ≤ BMI ≤ 26)25 – 35 lbs Overweight (26 > BMI ≤ 29)15 – 25 lbs Obese (BMI > 29)At least 15 lbs When pregnant, overweight and obese women are more likely to gain above the recommended weight. The California Department of Public Health (CDPH), Maternal Child and Adolescent Health (MCAH) Division utilizes Title V funding to encourage women to enter pregnancy at an optimal weight, gain appropriate weight during pregnancy, return to a healthy postpartum weight, and breastfeed, all of which may reduce the risk of childhood obesity. Since over 40 percent of births in California are unplanned 10, MCAH encourages all women of reproductive age to maintain a healthy weight in order to minimize chronic illnesses and pregnancy-related health risks. Examples of life course perspective strategies to reduce childhood obesity employed by MCAH during the pre-conception, conception and post-partum period to reduce childhood obesity are presented (Table 2). Table 2: Title V Obesity Interventions during preconception, pregnancy, and post-partum life-course Nearly half (45%) of women gained weight in excess of the IOM recommended total weight gain ranges for pregnant women. African American (53.0%) and White (51.9%) women, and those who were either overweight (63.5%) or obese (48.4%) prior to pregnancy, had the highest prevalence of weight gain above the IOM recommendations (Figures 3 & 4). Note: Maternal weight status (BMI) and weight gain (Figures 2-5) were categorized according to pregnancy specific definitions issued by the Institute of Medicine (IOM) 1990. These analyses were conducted prior to the release of their updated guidelines for weight gain during pregnancy (May 2009). Overweight and obese women were less likely to breastfeed, any or exclusively at 2 days and at 2 months post-partum (Figure 5). Note: The area under the red line demonstrates the cumulative risk of obesity over time. 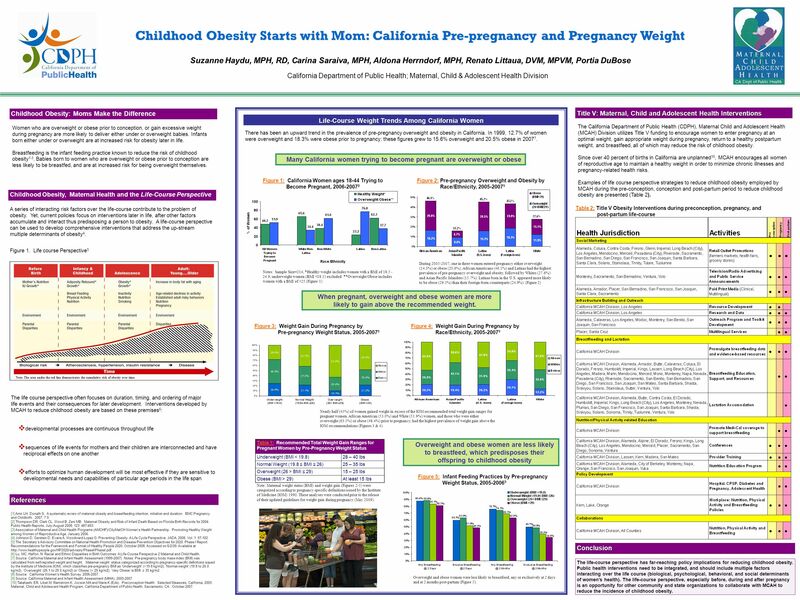 Download ppt "Childhood Obesity Starts with Mom: California Pre-pregnancy and Pregnancy Weight Suzanne Haydu, MPH, RD, Carina Saraiva, MPH, Aldona Herrndorf, MPH, Renato." Rachel Abramson Executive Director HealthConnect One. What role can culture play? Shiriki Kumanyika, Ph.D., M.P.H. University of Pennsylvania School of Medicine CCEB. 1 Healthy Babies in Healthy Families Health Update Karen Remley, MD, MBA, FAAP Commissioner, Virginia Department of Health November 2011. Implementation of WHO Growth Charts & Related Risks for Infants and Children. Building a Public-Private Partnership for Statewide Action: The Preconception Health Council of California Kiko Malin, MPH MSW Preconception Health Coordinator. Donna Strobino, PhD, Department of Population, Family & Reproductive Health. Press Release FOR IMMEDIATE RELEASE:CONTACT: Roseanne Pawelec, Tuesday, July 23, 2002(617) 624-5006 NEARLY HALF OF ALL MASSACHUSETTS RESIDENTS OVERWEIGHT.